Clicking on the either the picture or the underlined text will bring them up in a new window. 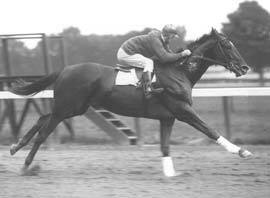 I love all horses, but Man o'War is the ultimate. Certainly among racehorses he's The One, in my opinion, that eclipses them all. He's the touchstone to which all subsequent American racehorses have been measured. I've been collecting data and memorabilia on Man o'War since I was eleven years old, and I recently put together a website. Wander on over and take a look. 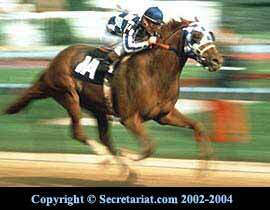 I remember watching in awe, with tears in my eyes, as this horse won the Belmont Stakes, the last race of Triple Crown. That image always brings God to my mind: joy, power and perfection. Although I tried hard to remain an objective observer years later, meeting him was one of the emotional highlights of my life. The warm feel of his silky coat beneath my hand, the exchange of a glance with a mild purple-brown eye, was a touch of the sublime. Although I've never owned or bred a Thoroughbred, I hope to do so some day. In the meantime, my membership in TOBA gave me a chance to hobnob amongst the Vanderbilts, Whitneys, Firestones, Mellons, Galbraiths, and DuPonts. It's also informed me me in on ownership issues and makes me feel one step closer to owning a (retired) Thoroughbred. Being a fan of Celtic art, music and folk tales comes with a price -- you expose yourself to books, movies, television programs, and performers with the same influence! 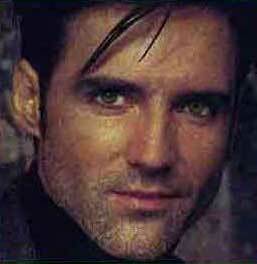 In this case, my interest introduced me to 'Robin of Sherwood' star Michael Praed. Michael's good-looks earned him a lot of attention when he was very young, which was a shame because it distracted people from his singing talent and his ability to take on character parts. Instead, he was typecast as a leading man, a category he played very successfully. For example, in London's West End Michael had the lead role of Frederick in Joseph Papp's 'The Pirates of Penzance', and later Alex in Andrew Lloyd Webber's first London production of 'Aspects of Love' opposite Sarah Brightman. Lately, he's been getting an interesting selection of roles, allowing him to stretch his creative wings. When Michael's fan club president took time out to start a new business and information became harder to come by, I created a website so fans could keep track of him. After Kate made her sabbatical permanent, Michael sanctioned my website, much to my shock and delight. Michael Praed's Fanfare is the new fan club subdomain. Want to see truly heavenly artwork? I recommend the website of my very talented, imaginative cousin Bryan, who manages to combine surreal outer space and dreamlike inner visions in his art. Bryan is equally at home on canvas and in the digital realm. He's a teacher who is an expert in art, astronomy and computers (specifically Macs). The Des Moines Register loves to quote him. This piece is 'Almost Home', which he created in a rare foray with Photoshop. 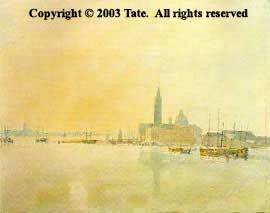 Born around the time of the American Revolution (1775), Englishman JMW Turner was a precursor of the Impressionists (last half of the 19th century) in his fascination with catching the illusion of light on canvas. Whereas the Impressionists tend to use mundane scenes, Turner was trained as a classical painter and used his vision to capture everything from classic epics to raging seascapes and the revolutionary steam engines of his day. His paintings glow. This one is 'San Giorgio Maggiore: Early Morning' from his Venice period. We saw it at the Tate Gallery in London. "Wait a minute! Is that...?" 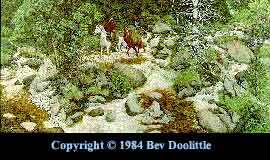 I frequently find myself muttering these words while peering, for the umpteenth time, at Bev Doolittle's "camouflage art". Bev loves to hide things in her work. This is more than expert optical illusion. What makes studying her art so fascinating is that inspection reveals additional symbols and stories to help complete her message about the subject. She's a very spiritual lady with a keen sense of humor. This is 'The Forest Has Eyes'. Remember checking out my cousin Bryan's artwork? Here's another fabulous artist in that family, his daughter Sara. Sara's main interest are fairytales, Celtic myths, world symbols and the like. She has taken a keen interest in discovering legends and old traditional folklore, and reinventing them to illustrate children's books. To your left is her watercolor 'Midir and Etain - the taking', part of a triptych she created for her recent thesis. It is based on the Celtic legend of the same name. And yes, her work is copyrighted and the use of this work is done with her permission. ACT-Fest is an International festival begun by Princess Grace and Prince Rainier of Monaco in 1957 to acclaim amateur theatre groups throughout the world. The festival is a means to educate, celebrate and evaluate amateur companies. In the United States there are state, regional and national competitions every two years to determine who will represent the United States in the International Festival held in Monaco every four years. Our community theatre group is a member of AACT and has won the state festival twice. Julie Morgenstern is the author of 'Organizing From the Inside Out', a book that helps organize space and time. Instead of trying to make you conform to HER ideas of organizing, she wants you to examine what works for you and why, then shift that to the parts of your life that are disorganized. Julie's techniques at work allowed me to earn departmental recognition in a Fortune 500 company. At home, my newly organized graphic arts studio frees me to be spontaneous with more creative ventures. Special thanks goes to Jo for helping me with this website. She provided encouragement and technical help. Thanks, friend! 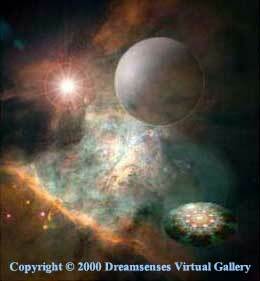 Copyright © 2002-2006 Celestial Realm except where otherwise noted. All rights reserved.